- precision of sealing procedure. Varied morphology of fissures in lateral teeth makes diagnostics of caries in fissures by means of dental mirror and probe ineffective (about 25% probability of caries detection). Fissure penetration with a sharp dental probe causes iatrogenic damage of enamel surface, often affected by demineralization processes. As literature reports, a less invasive method is diagnosing with the use of (5,59) electrical conductivity measurement (ECM), quantitative light-induced fluorescence (QLF) (5) and DIAGNOdent (58,68) in order to assess sensitivity and specificity of caries detection on occlusal surfaces (5,59). ECM demonstrates high sensitivity of between 93% and 96%. However specificity of this method is relatively low -less than 80% (71-77%). Specificity at the average level of about 75% means that 25% of healthy tooth surfaces is recognized and diagnosed as diseased and qualified for treatment, including invasive therapy. The ECM method enables long-term observations of carious lesions. The FOTI method (fiber-optic-transillumination) serves to diagnose carious lesions, primarily on masticatory surfaces. The sensitivity of the test does not exceed 57%. In laser diagnostics the phenomenon of QLF and DIAGNOdent device are used. The sensitivity of the laser method enables detection of tiniest fluorescence changes related to demineralization of hard tissues. Research indicates the advantage of laser measurement compared to bitewing radiogram in examining occlusal surface lesions. The probability of caries detection in fissures by means of electric conductivity measurement is 93%, whereas the accuracy of X-ray diagnostics (bitewing radiogram) is 75% (46). Sensitivity of microbiological tests (determination of Streptococus mutans count) is 67% (40,84). Comparison of clinical test results with radiological results indicated that during clinical study 15% of teeth did not demonstrate any carious centers in fissures which were detectable by means of radiological examination. During repeated clinical tests performed by the same team on individuals aged 14, 17 and 20 years, no carious centers were observed, whereas during radiological examinations carious centers in enamel and dentine were observed respectively in 26.0%, 37.5% and 50.0% of examined teeth. Application of the radioluminescence method showed carious centers in 32.4% of sealed teeth which during previous clinical tests were deemed healthy (85). In 58% of teeth caries was observed in fissures, which included enamel and dentine (19). The impact of fissure morphology on sealant's retention is associated with conditions of mechanical retention of material. Sealant is retained better in deep fissures than in shallow ones, and also better in fissures with initial caries, where fissure surface is uneven, than in fissures free from caries. The degree of tooth eruption and tissues' exposure time to oral environment under sealant have a significant impact on the prophylactic effect of sealing (6). Healthy enamel during tooth eruption is relatively well mineralized, however the process of forming the non-organic composition of the tissue is not yet finished and is subjected to constant physical and chemical changes. Physical changes are various types of abrasion, microcracks and fractures of enamel which occur when crystals of enamel surface layer become fully etched by acids from consumed food. Chemical changes include enamel maturing, which results from continuous dynamic exchange of ions between plaque and fluid in oral cavity on one hand and enamel surface on the other one. Study results indicate that anatomical group of teeth, their position in the dental arch (superior, inferior) may also impact prophylactic efficacy of tooth sealing. It has been proved that sealing of inferior teeth yields better results than sealing of superior ones. Higher efficacy of sealing of inferior teeth is caused by better access of the operator to masticatory surfaces being sealed, better penetration of viscous sealant into fissures due to pressure gradient. An analysis of available literature and own studies indicates that the lowest results are obtained in case of sealing superior second premolars. It is connected - among other things - with small occlusal surface, short fissures and proximity of the parotid gland. A comparison of sealant retention on premolars and molars shows that sealing materials demonstrate better retention on molars. Caries reduction in premolars is also lower compared to reduction on molars after sealing procedure. Lower caries reduction in premolars may be associated with later eruption of those teeth and their generally lower susceptibility to caries compared to molars (36). Type of sealing material has been deemed a particularly important factor which may impact the effect of sealing procedure to a greater degree than other factors. In caries prophylaxis of lateral teeth various methods and materials are used, e.g. fluoride varnish, resins based on bis-GMA formula (reinforced or not by microfiller particles) enriched or not by fluoride ions (44) and conventional glass-ionomer cements (chemically cured) (77,38), reinforced by silver filings (cements) and HEMA resin-modified cements (7), resins modified with polyacid (7), semi-fluid materials (13,14), ormocers (12,15). Sealing materials are characterized by liquid consistence which allows their inflow into fissures, however it is believed that sealant bonds with etched enamel on cuspal slopes and not at fissure bases (3). Results of studies on fluoride varnishes showed that despite their efficacy in suppression of caries on flat surfaces of teeth, they are less effective in suppression of caries on masticatory surfaces. This is due to the fact that compared to bis-GMA resins and glass-ionomer cements, fluoride varnishes are retained at the most for a few days only, therefore their prophylactic effect depends on the number of fluoride ions released while the varnish remains on the tooth. Fluoride varnishes reduce caries from 50 to 70% depending on frequency of application. In case of three applications during one year, caries reduction on masticatory surfaces is from 50 to 56%, whereas with three yearly applications during three years the value increases to 70% (61). 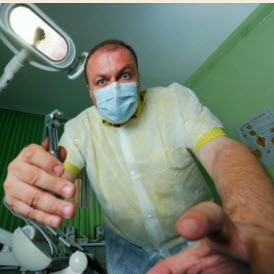 It seems that the long-term prophylactic effect of sealing procedure depends not only on the above mentioned factors - with reference to sealed masticatory surface and whole dentition - but also other factors, such as: type of fluoride compounds and frequency of its application, level of oral infection in a given individual, number of microorganisms from Streptococcus mutans group in saliva and person's dietary and hygienic habits. All mentioned factors may also be subjected to change in a certain period of time as a result of carious process activity modifications in a given individual. Matalon et al. (47) assessed antibacterial properties of sealing materials which contained fluorine. Four sealants were used: Helioseal F, Ultraseal XT, Dyract Seal and GC Fuji Triage. Samples of materials were "aged" for 30 days and rinsed daily with 0.05% solution of NaF for 14 days. After the last rinsing, a culture of Streptococcus mutans was added (about 1 x 106), which was placed on the surface of each sample and cultured for one hour at 37°C. Results indicated that GC Fuji Triage and Dyract Seal had antibacterial properties for 24 hours after the last exposure to fluorine. GC Fuji Triage maintained strong bactericidal activity up to 48 hours after fluorine rinse. After 72 hours none of the materials demonstrated antibacterial properties. The 30-day aging process resulted in total elimination of their antibacterial properties, but two-week daily rinsing with 0.05% solution of NaF restored antibacterial capability for glass-ionomer cement and compomer (47). Increased efficacy of sealing of masticatory surfaces can be obtained by improving sealant's retention, elimination of marginal leakage, which prevent caries development under sealant (14,15,33,52,83). Original laboratory research on improving efficacy of sealing by modification of etching time (23, 30, 60 seconds) and application of intermediate system of dentine bonding indicated, that bonding systems applied on enamel etched with acid fill spaces created by partly dissolved enamel and penetrate deeper. After polymerization a hybrid layer is created. Application of bonding systems (Concise LCWS and Helioseal) showed that depending on etching time and type of sealing material with or without bonding system (Schotbond MP i Dyract) it was observed that with extended etching time the bonding strength of Concise LCWS on enamel wall without bonding system decreased, whereas the bonding strength of Heliosal increased. After application of bonding systems appropriate for a given sealing material, with extended etching time, strength of bonding on enamel wall decreased for Concise LCWS sealant with Schotbond MP intermediate bonding system and increased for Helioseal with Syntac intermediate system. 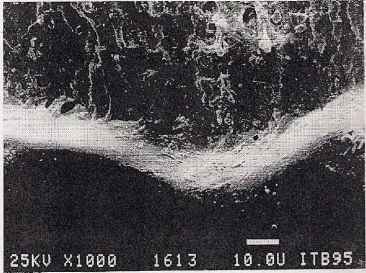 In case of etched dentine covered directly with sealant, bonding strength on enamel's wall was insignificantly different, whereas with the use of intermediate systems (appropriate for a given sealing material) an increased bonding strength on the wall was observed. In case of Concise LCWS with Schotbond MP - 2.7-fold, in case of Heliomolar with Syntac > threefold (33). Studies on morphology of Concise LCWS and Helioseal jonts with hard tissues of teeth indicated occurrence of two types of joints: gapless (adhesion on all surface), and with microfissure between tooth tissues and sealing material. The width of microfissures varied depending on sealing material - in case of Helioseal, microfissures were 30-90^m wide with dominating width of 30^m, whereas in case of Concise LCWS from 10-50^m with dominating width of 25^m. Moreover, micropores with diameter of up to 8^m were observed in Helioseal material, whereas in Concise LCWS material - vertical and horizontal microcracks of sealant extending to dentine were observed. After application of intermediate bonding systems and sealants, gapless joints were observed, however few had microfissures, which were from 1-50^m wide. Fig. 1. 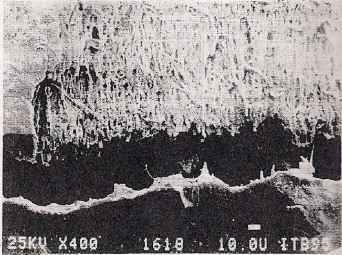 The SEM microphotograph of the section of etched dentin coated directly with H sealer (horizontal level section). Visible (from the top) microstructure of the dentin and the fissure between the dentin and the sealer ~ 20 ^m broad. Fig. 2. 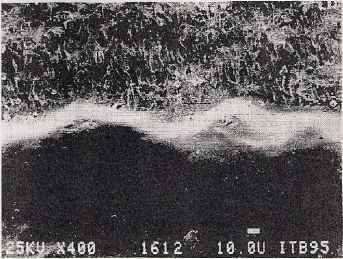 The SEM microphotograph of the section of etched dentin coated directly with H sealer (horizontal level section). Visible (from the top) microstructure of the dentin and the fissure between the dentin and the sealer (30 - 90 ^m broad). Clearly seen micro-pores in the sealer reaching the breadth of 8 ^m. Fig. 3. The SEM microphotograph of the section of etched dentin coated directly with Sy and H sealer (horizontal level section). Visible (from the top) microstructure of the dentin and the fitting hybrid layer and sealer. Fig. 4. 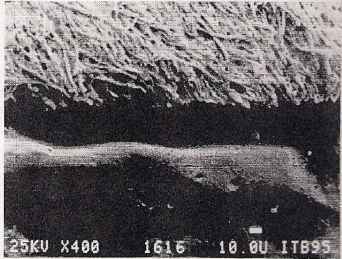 The SEM microphotograph of the section of etched dentin coated by indirect bonding system Sy and H sealer. Visible magnified fragment of middle part of photography fig. 3. In vitro and in vivo studies on application of X-ray microanalysis for assessment of penetration of selected elements included in sealing materials penetrating into dentine indicated that independent of type of conditions - in vitro or in vivo - an increased value of elements included in sealants and intermediate materials bonding to dentine was observed. Depth of penetration and concentration of elements in dentine depended on the method used for preparation of tissues. The highest concentration of elements on much wider and deeper surface was observed in in vivo samples, i.e. when tissue was etched, covered with intermediate material and then sealed, which shows that sealant infiltrated into sealed tissues, improving adhesion and tightness of the joint (33). One of the most decisive directions of research is improvement of adhesion of sealing materials to tooth's hard surface, because in that way a microleakage of microorganisms or their substrates can be eliminated. The main disadvantage of contemporary adhesive materials is their limited stability in vitro. The most frequently quoted reason for clinical failure is loss of retention and marginal tightness, thus in order to extend clinical period of sealant use, one should focus on improvement of bonding stability of those biomaterials with tooth's tissues. The effectiveness of direct bonding of modern sealants is quite good, independent of their type, however during clinical trials bonding efficacy of some materials decreases dramatically, whereas others demonstrate higher stability (20). Results of clinical studies depend not only on patients and used materials but also on external factors, such as operator's skills, type of light source, isolation method, type of instruments used for finishing of sealing material. Factors connected with the patient, such as age, oral hygiene, have a higher impact than any properties of sealing material. Also occlusal tension, eccentric stress is one of the main reasons for sealant loss. Additionally, apart from occlusal load, temperature changes in oral cavity may have a negative impact on tooth/ material interface, which is associated with repeated contractions/expansions of filling material resulting from higher expansion factors of thermal contraction than those for tooth's tissues. Tooth/ sealing material interface may also be destroyed by its exposure to water and human bacterial enzymes present in saliva. Penetration of water into hybrid layer and subsequent release of resin components leads to ineffective polymerization in situ and to their degradation. Hydrolysis of remaining hydroxyapatites and collagen fibers insufficiently covered with resin additionally impairs long-term efficacy of bonding. Interfacial junction sealing material/tooth is subjected to both chemical and mechanical degradation. Chemical degradation is hydrolysis and plasticization of resin components, also associated with water penetration. Hydrolysis may disrupt a conventional bond, join different units of collagen fibers as well as resin polymers. The process can be aided by bacterial enzymes and by dentine itself. Then in turn catabolites are released together with residual monomers which may weaken the bonding mechanics and promote more water penetration. Water may also decrease fiction forces between polymer chains, which is called resin plasticization. Repetitive mechanical loads can also damage bonding cohesion. During each mastication cycle, the interfacial junction is strained. At some sites, concentration of tension may exceed the bond's resistance to disruption, which results in formation of cracks that spread and lead to damage of material cohesion. A bond is more resistant to cracking in adhesive systems with microfiller particles compared to systems without microfiller particles (21,80). All resin-based adhesive materials while shrinking induce tensions on interfacial junction, which may lead to crack formation and consequently to microleakage. It was proved that a microleakage may appear between the hybrid layer and dentine even when no crack is observed (2,79).